CEDAR CITY — The Cedar City Council’s Wednesday meeting turned into what Mayor Maile Wilson called “arguing” during a discussion about the possibility of a new hotel in town. The development in question is the planned Windmill Plaza Commercial Subdivision. It would place a hotel on Main Street that is larger than any Cedar City currently has, right by the interchange onto Interstate 15 on the south side of town. The property line is next to a residential zone, however, and residents of the Cedar Knolls neighborhood spoke out during a public hearing about the land. This is not the first time residents have done so, as some spoke out at the last meeting and at planning and zoning meetings in the past. One resident, Robin Haight, stressed that he wanted the council to be fair to his neighbors who would be affected. 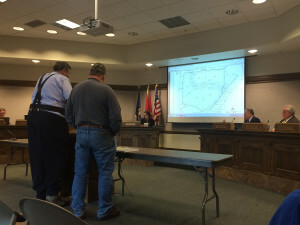 Because it’s difficult to find information on zoning codes, he said, the general public can’t know that the development is moving forward legally and fairly. He asked council members who had conflicting interests with the development to refrain from voting. Wilson reassured him that the council has been responsibly self-regulating when it came to possible or perceived conflicts of interest. Another resident, Wade Grimm, spoke on behalf of his 82-year-old mother, Barbara Imlay, whose property is directly next to the commercial area. Armed with a petition bearing 154 signatures, Grimm expressed concerns about traffic and sewage. There are over 20 bus stops in the area, Grimm said, and other elderly people would be affected by the development. Council member Paul Cozzens said while he respected Grimm’s concerns, he had spoken to many people in the neighborhood who were excited to have easier access to the freeway. “Wade, with all due respect, I don’t think you’re going to see that much increased traffic,” Cozzens said. Grimm also said he was worried about the hotel’s rear setback pushing up right against his mother’s property, but City Engineer Kit Wareham said there would be a 20-foot minimum setback between the hotel and the property line. Regarding issues with sewage, the council told Grimm the city’s engineers have been working to take care of the added burden. Council member John Black said he understood the concerns and had many of them himself after the previous council meeting, but they had all been covered, including a discussion earlier in the meeting about runoff from the development. In the end, the council unanimously voted to approve the vicinity plan for the hotel. Another topic of discussion in the meeting was sidewalks in town that do not comply with the federal Americans with Disabilities Act. Washington City has mapped out all its sidewalk ramps and marked which ones are ADA compliant, which Jarom Hlebasko, a member of the Cedar City disability awareness team, showed to the council. He said the new system could be used to improve sidewalk ramps in Cedar City, and the council discussed getting Boy Scouts working on their Eagle projects or SUU students to help map the town.